As if yesterday wasn’t exciting enough, today there’s more! Read on for the rest of Cori’s interview, and then… wait for it… a CONTEST!!! 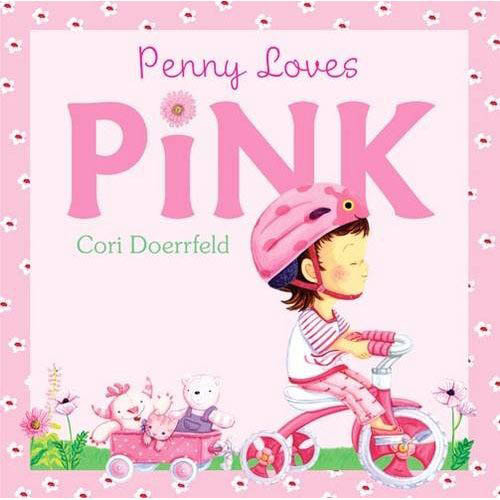 You could win a free signed copy of Cori’s new picture book PENNY LOVES PINK! SLH: PENNY LOVES PINK, your most recent title, is the first book you have both written and illustrated. Was the process different for you? Easier? Harder? What gave you the idea for the story? CD: PENNY LOVES PINK, will be the first book that I have both written and illustrated. It was definitely different for me than other projects, and more difficult. The main reason was because I cared so much about every detail, since my name was the only one appearing on the book. It was also more personal when editors suggested big changes or wanted to tone down certain elements. There were times when I wondered whose book it really was. In the end however, the publisher has been so supportive and truly wants only the best for me as an illustrator and author. I originally wrote the book in 2005. I was working at a daycare, and I could not believe how self-absorbed the two year olds could be. Some of them literally lived in their own worlds, where the color of a shirt, or a certain stuffed animal decided the fate of the world. The original book was called, Leah Loves Pink, inspired by a real little girl who would not potty train unless her toilet was pink. SLH: What are you working on now? Do you have manuscripts out for consideration? CD: Right now I am currently working on new ideas for books. I have one book out for consideration, a dummy in progress, and a few ideas just simmering in my mind. I will say that this stage is the most difficult for me. It takes a lot of focus and energy to actually sit and take a blip of an idea to a fully formed dummy with sketches. I also get distracted easily when a new idea occurs to me…it is hard to find time to work on them all! SLH: What are your inspirations? Most difficult obstacles? CD: The majority of my inspiration comes from the kids I have known and cared for. I was a toddler teacher and a nanny for several years. It was always fun to see what ideas the kids really responded to, and of course to hear all the wacky little ideas and sayings they had themselves. My own daughter is quite the inspiration at times. She gave me one idea that I hope to get into dummy form sometime soon. Other than that, there are the people who inspired me as a child, Jim Henson, Tim Burton, Chuck Jones, Bill Peet, Don Bluth, and the countless animators at both Warner Brothers and Disney. I spent a good part of my childhood wanting to be an animator, and animated films still influence and inspire me today. As far as obstacles go, time is my greatest enemy. I sometimes feel if I just had a tiny bit more time in each day, I could truly develop a masterpiece. SLH: Do you attend writers or illustrators conferences? Enter writing contests? CD: I have never attended any conferences. I really should find out how to become a part of my local illustrator/writing community. I do have one friend who I meet with on a regular basis to brainstorm and share ideas. And I once had the amazing pleasure to meet with some local greats including Caldecott Award winner, Stephen Gammell, and best selling illustrator, Derek Anderson. The birth of my daughter prevented me from going to the next group meeting…and I never got back in touch with them. The only contest I ever entered was to be the artist for The Minnesota State Fair Commemorative poster. I didn’t win this year, but someday I hope to make that poster. I love our state fair! CD: This question is difficult to answer. First off let me explain that the majority of my books were done under a work for hire contract, and therefore I earn no royalties whatsoever on those titles. I currently have four books still on the market trying to earn royalties, and two more on the way. The Brooke Shields books sold well enough I suppose, but I have been disappointed in the overall sales of the two books. I earned one royalty check with the first, and nothing on the second. The first book, Welcome to Your World, Baby! was picked up by a Korean publisher, so that has given me a little bit of hope. Penny Loves Pink has only been out a month, and I honestly have no idea how well it is selling. I have been very nervous about the over-saturation of pink themed books, and worry that it will ultimately effect sales. I think how well Penny does will influence whether or not Little Brown wants to do another book with me. I am still waiting for my best seller. It is definitely something I’d like to achieve, for my career and my bank account! SLH: Are you available for school visits? What is your preferred age range and group size? Do you have materials available for teachers and/or parents that go along with your books? CD: I am available for school visits. I taught preschool for many years, and I have also spoken to college level illustration classes. I do prefer to either talk with young kids, the age group my books are created for, or college level kids who are interested in pursuing a career in art. I would however be happy to speak to any class. When I speak, I try to bring along sketches, proofs from the book, and fun examples of my art to help show my process. I am also happy to prepare a project for the class, such as generating a story idea, or making a pink monster. This can be done while I am visiting the class, or whenever the teacher has time. SLH: What is your website, FB fan page, blog, twitter? CD: My website badly needs to be updated, but for now it’s what I’ve got. Please find me at www.coridoerrfeld.com and on Facebook as Cori Doerrfeld. One of my other goals is to make more of an online presence, so hopefully I’ll soon have a new website with a blog as well. SLH: Do you have any advice for beginning authors, illustrators or author/illustrators? CD: I truly feel that I myself am still beginning. I know for me the biggest shock upon getting my first book, is how quickly you are expected to work. I have typically had three to four months to complete an entire book from start to finish. That includes sketches, revisions, finished art, and revised finished art. It can be grueling at times, but ultimately it is worth it to have a job you love. I would also say that you should truly just create what you enjoy. Don’t try to force an idea or painting. Think of things that inspire you, that make you happy, and go from there. You do need a bit of a tough skin, especially if your work is published. Editors will want to change things, critics won’t like you, and sometimes you have no money. But I will say that there is nothing more satisfying than seeing your ideas in print. Thank you so much, Cori. I have really enjoyed hearing your thoughts on all of this. Thank you for sharing your experiences so generously. And now…. the moment you’ve all been waiting for… THE CONTEST and your chance to win an awesome prize!!! 2. Leave a comment telling why you would like to win PENNY LOVES PINK (or for whom) and listing your 5 favorite pink things! 3. Make sure to leave your comment by Friday February 18, 9 AM EST because the winner will be announced on Friday’s blog post! How About A Writing Course? Well for sure we would LOVE to win this! My daughter Hayden(5) is as well, obsessed with PINK! #1 favorite thing that is Pink,,My Daughter! #5 pink clothes- for Hayden of course! Thanks for the blog about all these great new books coming out. I'm a follower, and I love pink. And so does my daughter, Laynie. 2. Grapefruit lip gloss from Bath and Body Works. 3. Strawberry Cake, which I made for Laynie's birthday. 4. Pink cheeks! Is there anything cuter? 5. Flamingos. Call them tacky, but how can you hate anything that is naturally that pink! Thank you Susanna, for a blog that I love to read and that reminds me about what I love most, children's books. books. I love to line the bookshelf/toybox with all pink books! The girl's room has primary colors with pink and purple, so I like to highlight the pink. I would love to win the book for storytime, my favorite time of the day! Teri and Jenny, thanks for joining the contest. I love your favorite pinks! And Tara, thanks for stopping by! If I haven't already been by your blog, I'll be over soon! Hi fellow crusader. I noticed I was in the same group as you. Now a follower! Hello! LOVE pink! My current “thing” is pink sweaters! LOVE them! 🙂 I would love to win this book and give it as a b-day gift to my young neice. Thanks! I'm a crusader and now a follower as well! Thanks, Margo – great to hear from you! What an excellent interview (yesterday and today). It was very in-depth! You make an excellent interviewer, Susanna! And thank you for all the great insight, Cori. Hello! Fellow Crusader here. This was a great interview. I especially enjoyed the last answer about what it's like to start working as a writer. Hello there, popped on over from the crusade list to say hello and follow. Love the idea of making a dummy of your book. In my genre, we don't do that, but it sounds fun! Patricia and Raquel, thanks so much for stopping by. I'm glad you found the interview interesting. I love SImplicity In Volumes, and Raquel, I'm not sure if I've been to your blog yet, but if not, I'll get there! Hello fellow crusader! Just stopping by to say hello. I hope all is well and look forward to reading more from you. Love the giveaways.